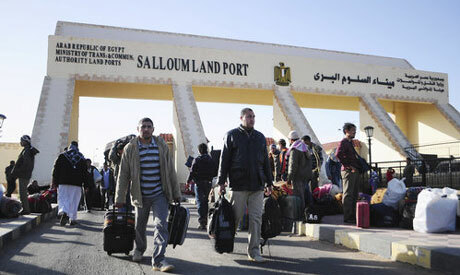 Egyptian authorities re-opened the Salloum border crossing between Egypt and Libya to allow the movement of a wide range of goods and to allow the passage of Egyptian truck drivers on Sunday, state-owned news agency MENA reported. According to MENA news agency, Egypt opened the border for the movement of goods after requesting that Libyan authorities guarantee the safety of the truck drivers. The Libyan government has demanded Egyptian drivers sign statements that say they are responsible for their own safety and the safety of their goods if they venture beyond the Libyan city of Tobruk which is close to the Egyptian border. Police Major General El-Anani Hammouda told MENA that Egyptian trucks have begun to cross the border in cooperation with Libyan homeland security, and that they were going to unload their goods at Tobruk, where they would be transferred to trucks driven by local drivers. Libyan and Egyptian authorities closed the Salloum border crossing to all goods except vegetables and medicine from Egypt nearly three months ago, due to the deteriorating security situation in Libya.